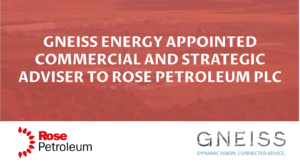 Gneiss Energy has been appointed commercial and strategic adviser to Rose Petroleum plc (“Rose”), as the company raises equity and appoints new board members. Rose is continuing to engage with prospective farm-in partners for its Gunnison Valley asset in Utah, USA, and are screening for other opportunities that will offer a route to establishing cash generative production in the near term. With interim funding now in place and with the assistance of the new board members and advisers, Rose will continue to work on identifying the optimal path to deliver shareholder value and will provide an update to their shareholders in due course. Gneiss Energy Limited (FRN 796817) is an Appointed Representative of Talbot Capital Limited which is authorised and regulated by The Financial Conduct Authority (FRN 489839).